The first ever water park to open on Koh Phangan opened in November 2014. Now one of the top attractions on the Island the Slip N fly water park is open for a few days twice a month. The two slides are the main attraction to this venue, first Slide called ‘Daddy’ and second slide called ‘Mummy’. Daddy slide will give you a launch into the air of over 6 meters, a surprising adrenaline rush to your body once your body swoops into the air from the slide and into the deep zone of the pool, which is 4 meters deep. The Mummy slide will not throw you so high but give you distance across the pool, expect to fly over 5 meters across the pool. The slides are safe as long as you follow the guidance from the life guards. Lifeguards are working full time around the slides to monitor people on the slide and help in giving guidance. The venue plays loud music from an international DJ’s who will give the place buzz with the latest beats. This is one of the only day party’s on Koh Phangan and one of the only water park party you will find in Thailand a water world, a really good party atmosphere and fun day in the sun. An abundant selection of cocktails, soft drinks and beers are served at the bars. The venue has two snack bars one serving a selection of snacks including burgers and the other is Chef Gam who serves BBQ Thai style snacks. Overall the Slip N Fly water slides are a great day out and a place to remember. 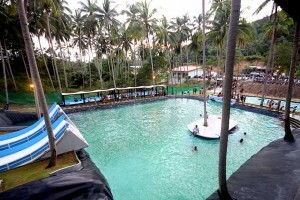 700,000 Litre pool, the largest pool on Koh Phangan. Pool deep zone is 4 meters deep. 2 x 40 Meter long slides with 45 degrees elevation ramp at the end. 1 Twisty toboggan slide over 60 Meters long. Chill-out areas 17 Salas with shade. 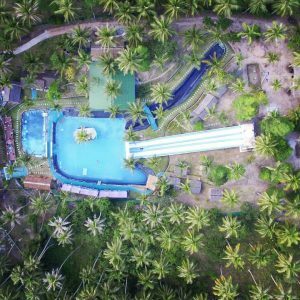 The water slide is not open every day, it opens for 2 or 5 days twice a month, normally around the full moon party and half moon party dates. 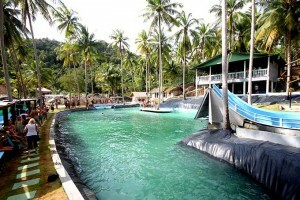 The Slip N Fly water slide can be found in the Madeuwan Jungle area of Koh Phangan, See Map for reference. A taxi driver will know the location , its about 10 minutes drive from Thong Sala.